The wind is strong, the weather is warm, and the beer is cheap. …and did we mention the length of the coastline? (it’s 3,444 km, FYI). By all accounts, kiteboarding in Vietnam is awesome. The wind blows hard during the high season, which runs from October to April (on paper, at least. It’s maybe more realistic to consider the season as November-March). 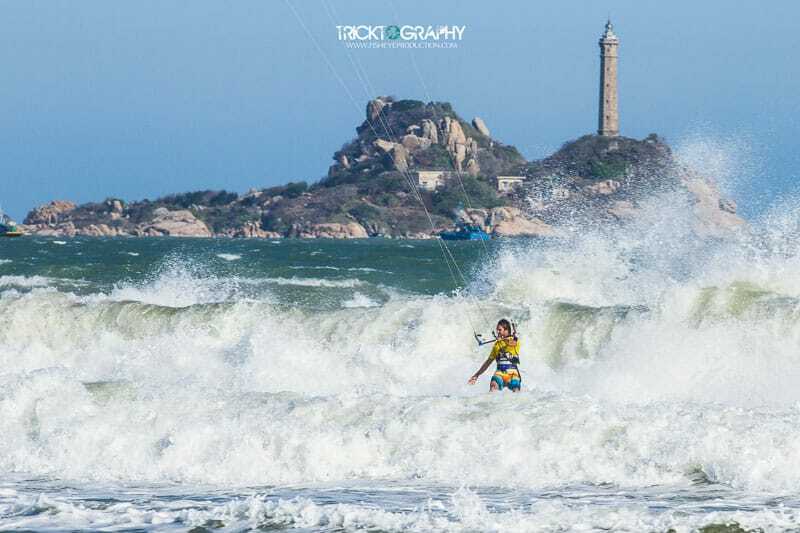 Vietnam’s kitesurfing season peaks from December to February. But it’s not just the winter winds that blow; you can even sneak in a couple of summer sessions, too- as long as you stick around long enough to make the most of the sporadic southwesterlies. 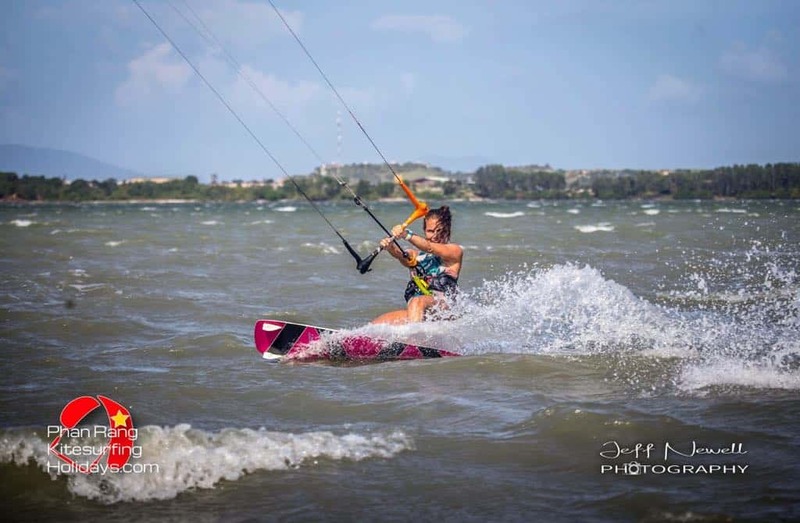 What can you expect while kitesurfing in Vietnam? Over the past 10 years, Vietnam has established itself as one of the best kiteboarding locations in Asia (you can double that number if you consider the windsurfing nomads who have been coming for 20 years or more). While Mui Ne has long been a top spot for strong wind lovers, surfer dudes, and salty dogs, there are a ton of other incredible kite spots in Vietnam that tend to slip under the radar. From north to south, here are 9 noteworthy locations for kiteboarding in Vietnam. With its own international airport (and close proximity to one of Vietnam’s most popular tourist towns, Hoi An), the kitesurfing game in Da Nang is one of convenience as much as good conditions. The beach is big and the water is much less crowded than some of Vietnam’s southerly kite spots. That said, the facilities are also far less developed. The wind is light, but the upside is that it’s sometimes possible to kitesurf here during Vietnam’s ‘low’ wind season (April-October). During this time, you could be treated to a string of days with 12-18 knots coming from the southwest. Post monsoon season can also be great for waves, so if you’re into a spot of surfing Da Nang is worth a look. There are a small number of surfing schools that cater for the community of local riders as well as the wave hunting nomads who pass through. Here’s a listing of available hotels in the area. Learn more about the city through the eyes of nomadic notes. Vietnam’s notorious south central party town has built up a lot of hype over the past few years. It wasn’t long ago that Nha Trang was a low-key beach town with authentic roots, but in true Vietnam style, developments happened fast and furious….and shiny. The city still holds an appeal for a lot of travelers looking to clock in some beach hours. Nha Trang has developed right along the beachfront, where it ispossible to kitesurf (at least wind-wise, it is) although the bulk of the kiting happens at Bai Dai Beach, 23 km south of the city. It’s another light(ish) wind spot (13 and 15 meter kites are standard) that enjoys some gentle rolling waves that are great for practicing your beginner surf skills. There are a couple of surf and kite clubs scattered along Bai Dai Beach, each of which offers lessons, rentals, and storage. For accommodation, check out the the best options on HotelsCombined. It feels worlds away from the bright lights and bustle of Nha Trang, but Cam Ranh’s glorious landscapes and quiet lagoons are only a stone’s throw from the city. This is a seriously underrated kite spot. Actually, make that two kite spots. The first spot is wave territory- and fairly big waves, at that. The water is absolutely gorgeous- totally clear blue- and the beach is lined with shaggy palm trees. A little further down the coast you’ll find a military base, in front of which is a perfect, man-made, flat water lagoon. Tempting as the flat water may be for beginners, this spot is only suitable for more advanced riders (there’s some fishing lines and wooden posts sticking out of the water). Once you’re comfortable riding upwind, however, this spot is a breeze. If you’ve been traveling down from the north, you’ll find that Cam Ranh offers the first taste of strong wind along the coastline. That having been said, it’s often the place to go to when the wind is too strong in the next kitesurfing spot to the south- Phan Rang. Cam Ranh has a good choice of hotels available, but if you’re looking for the perfect location, check out Escalade Experience. This is Vietnam’s newest kiteboarding destination- and one that’s drawing a lot of interest. A far cry from the choppy waters in Mui Ne, Phan Rang is all flat water, clean breakers, and spacious sandy beach. The main spot during the season is My Hoa Lagoon, where you’ll find flat water inside the reef and sweet little waves breaking off the outer edges. The wind is strong- but stable (you can expect 20+ knots almost every day during the high season). When the wind direction switches in the summer months, the nearby Ninh Chu Bay is the place to head for. Phan Rang also has some of the best surf in Vietnam. 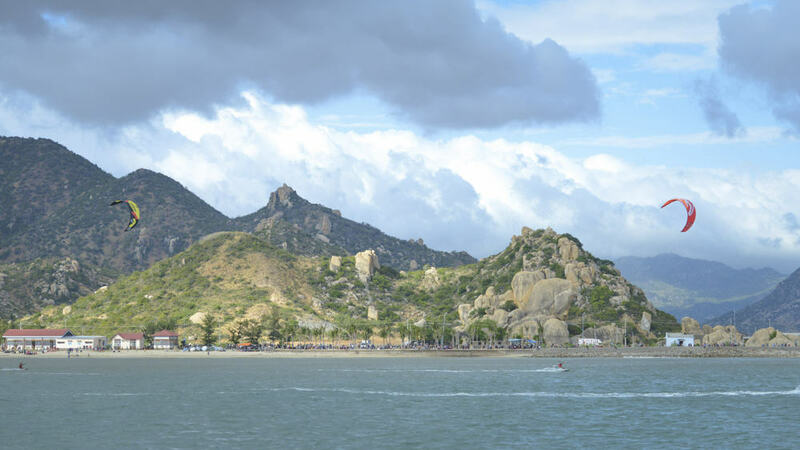 Off the water Phan Rang has tons of adventure potential: hiking in the national park, swimming in hidden waterfalls, and cycling along the picturesque beach roads. Sorrento Beach Club is the most popular resort in Phan Rang for kitesurfers right now, so make sure to book well in advance if you want to get a room there! The other 2 kite resorts in town are Phan Rang Kite Center, and our old friend’s Phi Kite School. The neighbouring Vietnam Surf Camp also offer glamping facilities onsite in their hand built teepees- pretty sweet! Head over to our detailed Phan Rang travel guide for more information about the top things to do in Phan Rang and travel tips, or to our complete guide to kitesurfing in Phan Rang for further info on spots, season, conditions, and more. For the best part of 2 decades, Mui Ne has been touted as Vietnam’s premiere kitesurfing destination. 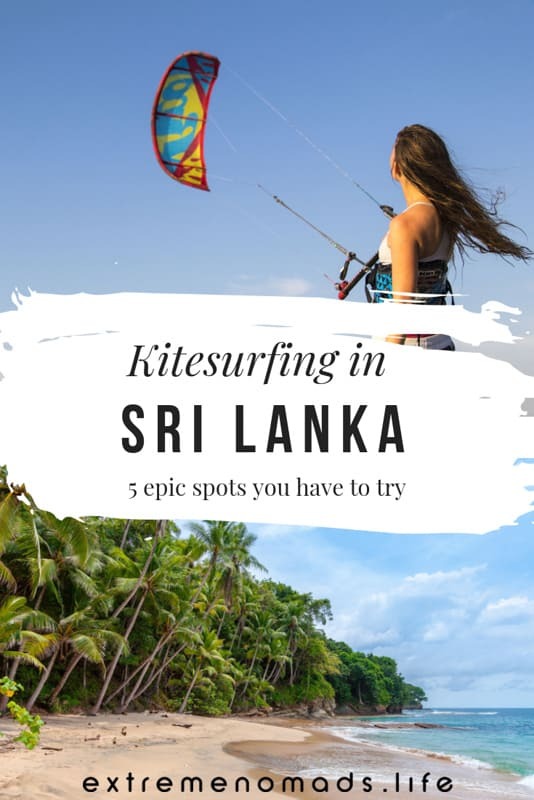 And of all the epic things to do in Mui Ne, kiting is our absolute fave. Today, there are easily a dozen schools in operation here- not to mention the myriad other businesses that have developed around the kitesurfing community. The wind season in Mui Ne is normally quite reliable (although we’ve recently seen the wind seasons shifting and becoming less predictable- which is something of a global phenomenon). From November until the end of April, Mui Ne enjoys 18-25 knots on 80% of days- and it’s not uncommon for it to blow well in excess of 25 when a weather front moves in. Water-wise, it’s usually rough and choppy. 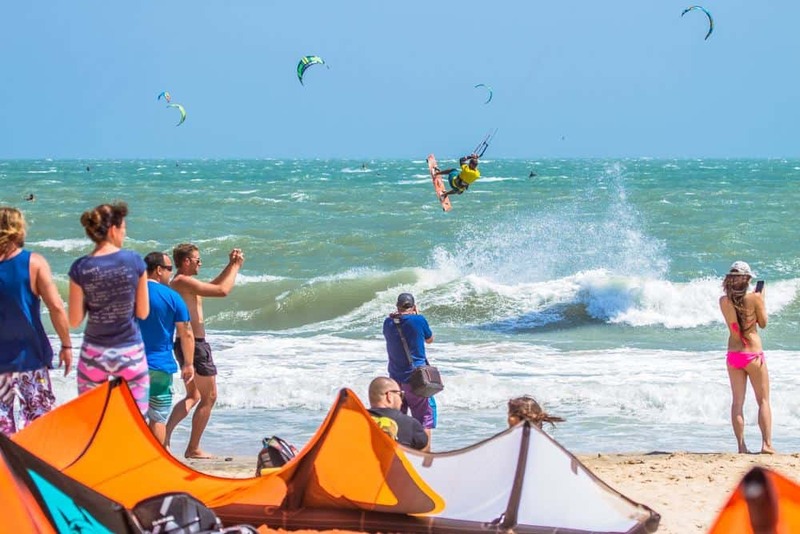 It’s not the easiest place for beginners, but it is by no means impossible to learn here- as we see from the dozens (if not hundreds) of new kiters who get up and riding for the first time on Mui Ne’s challenging chop every season. In terms of the beach itself, the size of the sandy area changes dramatically depending on the tides and time of year. Beach erosion is a big problem in Mui Ne, and is usually at its worst around mid December for about two weeks. People often talk of the challenging shore dump here- another symptom of the beach erosion. In reality, the shore dump is only really significant during the times when the erosion is at its worst; most of the time it’s not an issue. Along the main kitesurfing beach, C2Sky Kite Center enjoys the biggest beach area. 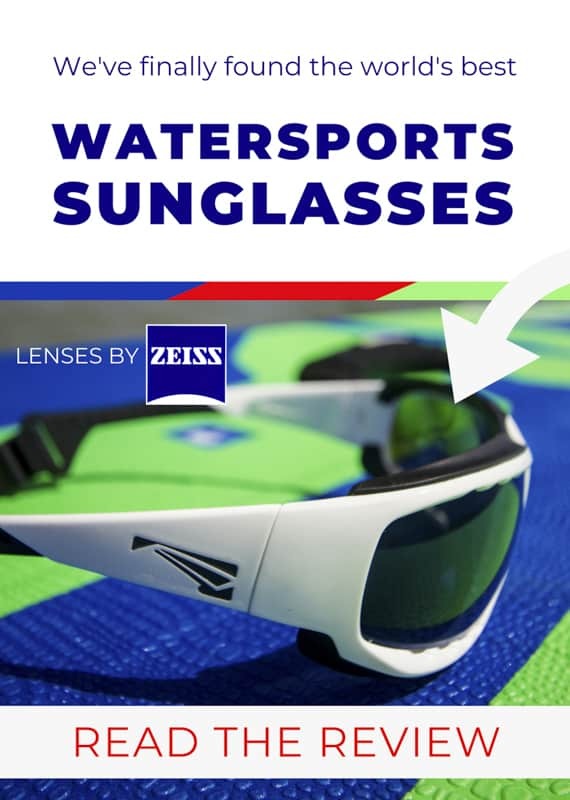 As an IKO registered center, they offer lessons, rental, storage, SUP excursions, foiling workshops and foil rental, and they even hold regular instructor training courses. They’ve got an absolutely stellar reputation- and they tend to book up fast during the season. Be quick to reserve your C2Sky lessons and accommodation! C2Sky Mui Ne is also the first kite school in Mui Ne to set up their own surf cam and live windguru meter, so users can tune in online to watch for wind and check out the conditions themselves before heading down to the beach. With Malibu Beach to the north and Little Buddha to the south, kiters (and surfers, for that matter) have their pick of the bunch. Mui Ne has an impressive choice of hotels and guesthouses for all budgets. From luxurious, beachfront Mia Resort to the young and laid back Backpacker Village, you should have no problem finding the perfect room. For further info about kitesurfing in Mui Ne, check out our complete guide to kitesurfing in Mui Ne. Ke Ga is the next cape down the coast after Mui Ne. Known for its iconic lighthouse facing out over the sea, Ke Ga is worth visiting for its landscape alone. As far as kiteboarding in Ke Ga goes, it’s definitely a spot for the more adventurous. On one side of the lighthouse there’s a lot of rocks, and on the other side it’s very tidal. Timing is the key here; you’ll only be able to get out of the harbour when the tide is low- but once you’re out there you’ll find the conditions are actually quite nice. Even if the wind isn’t on, Ke Ga is worth a visit- simply for the beauty of the place. If the tides are right, you can almost walk all the way to the little island that sits right off the coast (or hire a fishing boat to nip you over), and the hike up to the lighthouse is very rewarding. And after that, you can always head north to Mui Ne or south to La Gi. Find the best hotels in town on HotelsCombined. Thanks to its close proximity to Saigon, La Gi is a popular destination for weekend breakers looking to swap the city for the seaside. It’s the home of super quirky and very cool Coco Beach Camp, which- conveniently- is where you’ll also find the kite beach. La Gi’s winds are lighter than Mui Ne, but that also means the water conditions are much gentler as well. Coco Beach used to have their own watersports center, but currently it’s out of action (you may be able to rent a couple of surfboards if you ask). Best off bringing your own gear. Check out some of the hotels available in town on HotelsCombined.com. Down the coast less than an hour from La Gi, Ho Tram is the home of supermassive new hotel complex and casino, The Grand Ho Tram Strip. Outside the back of The Grand, there’s an equally supermassive beach- already equipped with its own dedicated watersports center. The wind here is similar to Ke Ga (i.e. it’s lighter and somewhat less reliable than Mui Ne or Phan Rang, but still blows 12-18 knots regularly when the season is on). The big, spacious beach and easy shore break (not to mention its close proximity to Ho Chi Minh) make it an appealing alternative to the high winds and challenging water conditions in Mui Ne. Last on this wonderfully windy strip of Vietnamese coastline is Vung Tau, a busy port town that welcomes hordes of travelers coming up on the hydrofoil ferry from Ho Chi Minh. The wind in Vung Tau is similar to Ho Tram and La Gi, but facilities are limited. There is some small surf to be found here, and thanks to the establishment of a handful of local surf schools, you’ll have easy access to board rentals and lessons. There’s also plenty of choice in terms of accommodation in Vung Tau. The nearest airport is Ho Chi Minh (Tan Son Nhat International). From there, you have a choice between public buses (cheapest), tourist buses (slightly more expensive, but way comfier), or trains (similar travel time and cost to buses, but better views). You can also access Vung Tau by ferry from Ho Chi Minh. If you’re willing to part with a bit more cash, you can always choose to hire a private vehicle to get you door to door. Cam Ranh International is the closest airport. Hiring a private vehicle is definitely the most convenient way to access the kite spots up here, as public transport is slightly less foreigner friendly, and that much harder to navigate than in Ho Chi Minh. Da Nang has its own international airport which is only a short drive away from the kite beach. Best off grabbing a Grab car straight from the airport; they’re fairly cheap, and they’ll get you right to the spot. Internet in Vietnam varies greatly from place to place (see our Vietnam spot guides for details on internet speeds in a particular location). In the cities and developed towns like Mui Ne, fiber optics are widely available and offer speeds of up to 50 MBps (though 10-20 is much more common). Wifi is everywhere and free in virtually every hotel and guesthouse. If you’re planning to head to Vietnam for a kitesurfing holiday, your best bet is to grab a tourist SIM card. They’re super cheap and easy to come by (from $5 USD for a month of 3G/4G options). 3G/4G in Vietnam averages 5.4 Mb/s, which is lower than the Asia-Pacific average of 9.69 Mb/s. Vietnam’s 4G networks cover 95% of the nation. The main 4G providers in Vietnam are Mobifone, Viettel and Vinaphone. See a full guide on Vietnam’s Sim cards options here. Pssst: if you’re thinking of visiting Vietnam for some kitesurfing, make sure you check out our review article of the best kiteboard travel bags for your adventures! Have some specific questions about kitesurfing in Vietnam? Leave it in the comments section below. Want to connect with other Extreme Nomads? Just join our Facebook group and get to know the community!